Dom Pérignon may need little no introduction, yet on release of each new vintage winemaker Richard Geoffroy spends a few weeks travelling round the world in order to introduce his new baby to opinion formers in Europe, the USA and the Far East. Geoffroy is not only a diligent ambassador for the brand, he’s also a man after my own heart in that he believes that the ideal way to explain his wines is to demonstrate their food friendliness.This year, Geoffroy’s mission was to talk about two of Dom Pérignon’s Rosé releases, the 2000 Dom Pérignon Rosé and the house’s new cuvée, the Oenothèque Rosé 1990. Working in tandem with Dom Pérignon’s chef, Pascal Tingaud, Geoffroy had decided to explore the harmonies between Rosé and spice, via a menu that conjured up the dishes of the spice road. This gave the team room to play with flavours derived from the traditional cuisines of India, Turkey, the Middle East and North Africa.So far, so romantic – but were the matches (and the wines) any good? I joined a group of London’s top sommeliers to sample the wines and the dishes together. The first dish, a punchy salad of herbs with preserved lemon served with a dressing of yoghurt and garlic, initially seemed to dominate the wine, but on the finish the wine’s aromatic notes of dried herbs and hay harmonised beautifully with the herbs, prolonging the flavours in the mouth. Next came an assortment of punchy mezze dishes whose flavours referenced the Middle East and North Africa. The sweet earthiness of a beetroot and orange salad picked up on the Pinot Noir notes in the wine. Less successful was the pairing of a carrot salad, whose complex notes included ginger, mint, mango and pistachio – all of which proved a bit overwhelming for the wine. A dish of baba ganoush, an eggplant dip, had a smoky note which picked up on similarly smoky notes in the wine. Another element that worked in its favour was the creamy texture of the dip, which seemed to amplify the wine’s silkiness. The best match of all, however, was an earthy dish of chickpeas and lentils. Despite the humble nature of the ingredients, the dish’s flavours and textures were complex yet restrained, and its nutty notes and cumin spice seemed to bring out yet more complexity in the wine. The piece de resistance, however, was provided by an unusual Rajasthani curry of watermelon, whose complex combination of sweetness, crispness and spice highlighted the elegance of the wine, bringing out layers of floral and citrus aromas, as well as a subtle minerality and a haunting finish tinged with notes of fennel and star anise. The arrival of the next wine, the Oenothèque Rosé 1990, caused a buzz of excitement in the room as it was poured into big, tulip-shaped Burgundy glasses. The first Rosé to be launched in the Oenothèque range, the wine was disgorged in 1997, leaving time for the colour to evolve to an orangey-pink, and for its palate to develop complex layers of truffles, smoke, autumn leaves and orange peel enlivened by a gentle prickle of bubbles. The wine came across as being more like a gently evolving Pinot Noir than a Champagne, and Geoffroy described it as being ‘as languorous and silky as a guitar solo by Carlos Santana’. Its first pairing was a dish of couscous, caramelised onions and sea bass, perfumed with rose petals and gentle spices. It was a complex dish, but one which highlighted the many aromas of the wine – it was the food and wine matching equivalent of Mozart sonata: delicate, precise and layered all at once. The next dish was a small bowl of harira, an interpretation of Morocco’s traditional Ramadan broth. Its pungent lamb aromas and richness brought out the wine’s structural elements, particularly its sensuous texture and its lively acidity, finishing on a hitherto-unrevealed note of candied pineapple and citrus. 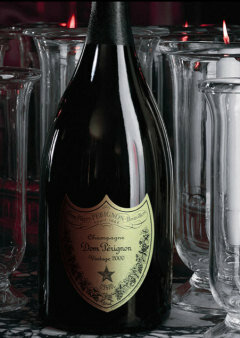 While I wouldn’t necessarily recommend that you spend all day in the kitchen recreating Dom Pérignon’s epic lunch – even if you’re lucky enough to have got hold of one of the 1,000 bottles of Oenothèque Rosé 1990 that have been made – the meal highlighted the fact that not only is champagne a versatile food wine, but also that Rosé can take on a whole range of spicy dishes and come up trumps. 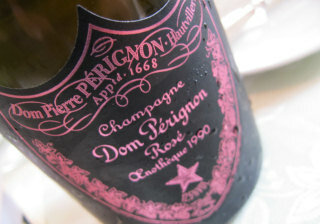 See stockists of Dom Pérignon Rosé on wine-searcher.com.